The heat has broken. Overnight lows have been consistently around 60 degrees Fahrenheit, climbing back into the 70s or low 80s in the daytime. Late summer wildflowers: jewelweed, morning glory, clover, Queen Anne’s Lace, thistles, a few defiant out-of-season blooms on Crown Vetch, ragweed, goldenrod, bedstraw, Black-Eyed Susans, coneflowers. Mimosas’ yellow seed pods, almost as pretty as their pink and white flowers. What’s delayed this post has been making the time to look up an unusual caterpillar I saw in the road on August 30. It was a sort of mocha or even pale persimmon color, two and a half or maybe three inches long, with two pairs of horns on the segments immediately behind its head and a pair of smaller bristles on each segments behind those. The skin showed a stubble of white hairs at close range, but it was not a “hairy” caterpillar. From a distance it looked a bit like a woman’s little finger. The size and the two pairs of horns showed that it was one of the big silk moths, but which one? Books, other than Paul Villard’s, show pictures of adult moths and usually ignore the caterpillars. Looking up any plant or animal online is a slow, tedious process. I finally did it and, after looking at Bugguide.com, have tentatively identified the caterpillar as an earlier stage of Eacles imperialis…possibly a distant relative of the strangest “pet” I’ve ever had. 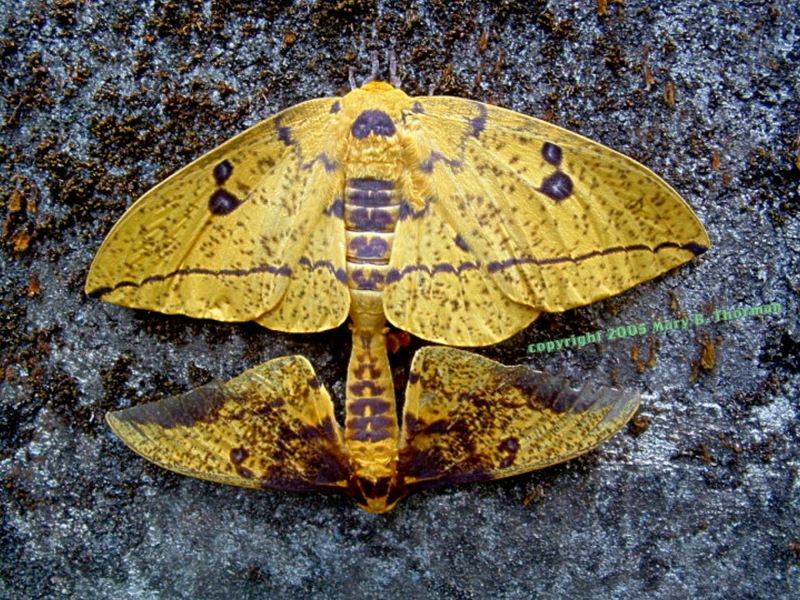 Some of the big silk moths, like those buck moths that have become a hub at the Blogspot, are described as “variable.” They can have any of several different color patterns and still be recognized by other moths as part of the same species. Eacles has been described as the most variable of all. Caterpillars have green and brown “color morphs.” Moths are very large; females are generally bigger than males, with considerable overlap; individual wingspreads have been measured from three to almost seven inches (8-17.4 cm). All Eacles are gaudy, with a color scheme that may make them look like autumn leaves to predators, although they fly while nearly all the real leaves are fresh and green. Males generally have more brown and females more yellow on their wings. The brown spots are not your usual dull, dead-leaf brown, but a designer-type shade that some writers call purple. Patterns of spots vary. Eacles seem completely unprejudiced about size and color. They aren’t very common; what keeps them from becoming pests is that many individuals never find mates, and those lucky enough to find mates seem to appreciate any member of their species they find. The moths aren’t equipped to travel far. Their homebody instincts lead them to return to the same place to rest during the day and, if they’ve found a mate, to snuggle all day. Though the moths probably don’t perceive or recognize humans in any way humans or our pets would understand, their instinct to follow their own scent to “home” can make them seem like loyal pets. After mating the female uses up her physical resources distributing relatively few eggs as widely as possible. Like the other big silk moths, they don’t eat and live less than a week, aging visibly every day. The silk moth family that includes Eacles and Citheronia are too big to hide and seem to rely on an in-your-face, touch-me-if-you-dare defensive system. Further south, where even bigger moths and butterflies are common, the garish color schemes of these moths might be less adaptive. In North America they have a “What is that thing?” effect on humans and, presumably, on bats and birds. Cats leave the caterpillars alone, but the caterpillars are active in late summer, in between nut crops, and squirrels often eat them. The caterpillars seem to mimic a family of spiky, inedible little lizards that aren’t actually found in the Eastern States, and share the lizards’ nickname of “devils.” It’s unfair since, despite their prickliness and ability to chomp, these caterpillars are downright lovable compared with the “stingingworms” that grow up to be a slightly smaller family of big silk moths. People are always picking them up and posing for snapshots, showing both how big and how harmless these “horned devils” are. 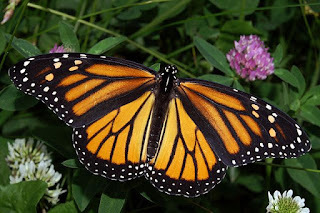 Butterfliesandmoths.org has a photo collection showing the range of sizes, shapes, and colors. The one I found was the brown version of the modest-looking green caterpillar near the bottom of the page. This one has orange-yellow horns and hairs long enough to be described as hair, while mine had black horns and stubble. As a bonus, at the bottom of the page is a link to Professor Raupp’s story about the moth that provided Ronia’s screen name.